Will you be celebrating International Mud Day? “Every child should have mud pies, grasshoppers, water bugs, tadpoles, frogs , mud, turtles, elderberries, wild strawberries, acorns, chestnuts, trees to climb. Brooks to wade. water lilies, woodchucks, bats, bees, butterflies, various animals to pet, hayfields, pinecones, rocks to roll, sand, snakes, huckleberries and hornets. Any child who has been deprived of these has been deprived of the best part of education” — Luther Burbank. Today is the first international celebration of Mud Day! The very first 'Mud Day' was started in Nepal and Australia, by Bishnu Bhatta and Gillian McAuliffe, in an effort to get children closer to nature. You already know my kids play in dirt if you read this post. 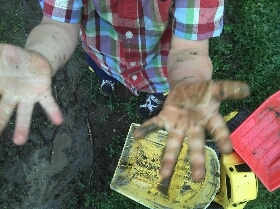 Kids are meant to get dirty! There's no way we'll be getting as filthy as the children in these photos, but a little dirt is perfectly fine with me. Hands On: as we grow has 30+ dirty and muddy activities that you'll want to check out. Teach Preschool shows you how to make Rainbow Mud Art. Let the Children Play has some great photos and quotes about mud play. "Dirt Is Good" For Kids, Expert Insists"
Have a wonderful day and GET DIRTY!